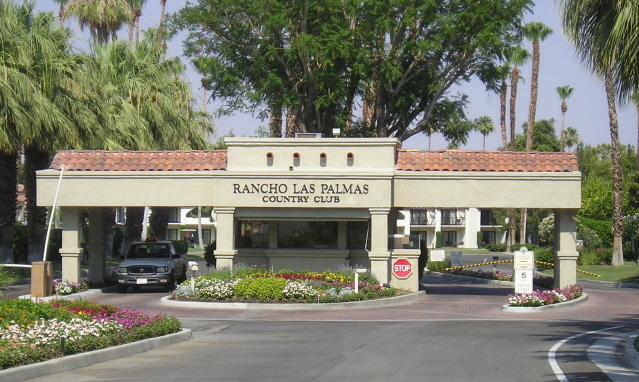 Rancho Las Palmas Country Club boasts the best location in the desert! Rancho Las Palmas offers a 27 hole full length golf course, 25 championship tennis courts and a full service tennis and golf pro shop. Guests can play unlimited golf and tennis and there are reduced rates offered for monthly guest packages. There is a magnificent clubhouse with full bar and dining facilities in addition to a snack bar. There are 26 pools and spas throughout the country club assuring that every condominium is just a few steps away. All condominiums are ground level with attached garage, laundry rooms and bar-b-ques. Each property is individually owned and decorated. Property owners have stocked their vacation home in a turnkey fashion for your enjoyment and have decorated in their own taste. Rancho Las Palmas Country Club boasts the best location in the desert! The front gate is located on Bob Hope Drive in Rancho Mirage directly across from The River, an outdoor dining, shopping and entertainment complex. The back gate is located on Monterey Avenue close to the Palm Desert Mall and El Paseo shopping. The country club property is shared by the newly renovated 5 Star Rancho Las Palmas Resort and Spa. Guest can easily walk to The River and enjoy dinner or a movie, to the College of the Desert weekend Street Fair or enjoy a spa day at the Rancho Las Palmas Resort and Spa. Looking for a Splashtopia alternative? 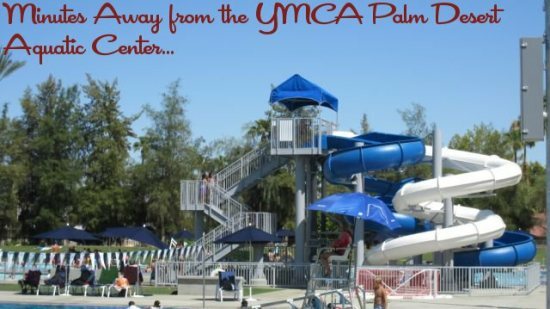 Vacation Rentals of the Desert Recommends the YMCA Palm Desert Aquatic Center, located just a mile from Rancho Las Palmas Country Club back gate. Open daily and all year round, the Aquatic Center offers classes, sports, and activities for all ages. As little as $6 a day gives you access to Multiple Pools, Water Slides, a Wadding Pool for Toddlers, and much more. Call us at (760) 324-3456 or the YMCA at (760) 565-7467 for more information.